An inspiring and uplifting memoir about falling in love and find yourself. People who know me and have followed this blog for a while will know that I am gay and love keeping up with the LGBTQ+ community on YouTube. There has been a few people that I have followed for years, Lucy Sutcliffe, one half of Kaelyn and Lucy, is one of them. So when I found out that she was releasing a book I knew it was something I was going to want to read – like a lot of other people considering it sold out on Amazon in less than a week! Plus you all know that I enjoy a good biographical book… I know I’m just a really nosey person! One of the things that made me want to read this book is there aren’t many books, fact or fictional, which are about gay relationships. 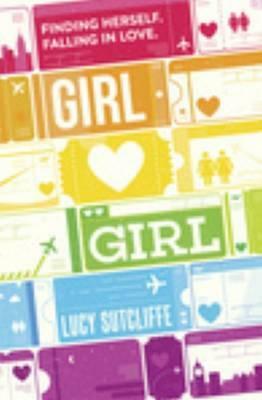 So I think that the fact Lucy has put Girl Hearts Girl out there is great for the LGBTQ+ community as it will help this who are struggling with their sexuality because it will give them someone that they can relate to. I really like the fact that she is honest about her experience in coming out and the people she met along the way doing so. She doesn’t blinker the audience to what went on which would have been quite easy for her to do. After reading Lucy’s book and how her life was leading up to coming out and the start of her relationship with Kaelyn I would love to read the other side from Kaelyn! It would be great to fit the two sides together. Overall I really (really) enjoyed this book. I read it over three days (I could have quite happily read the book in one sitting) whilst travelling to and from work and found that it was quite an easy read split up into lots of little short chapters which broke the book down really well, staying focused on the main message of the book. Unlike some of the other biographical books that tend to go on forever Lucy managed to keep it condensed and to the point which always makes you want to keep reading as it covers everything you want to read. If you have come out, are wanting to come out or you just love reading about people’s lives then you will enjoy this book. Also in case Lucy sees this, I hope they bring this over to America soon!